Lithium batteries or AGM batteries? 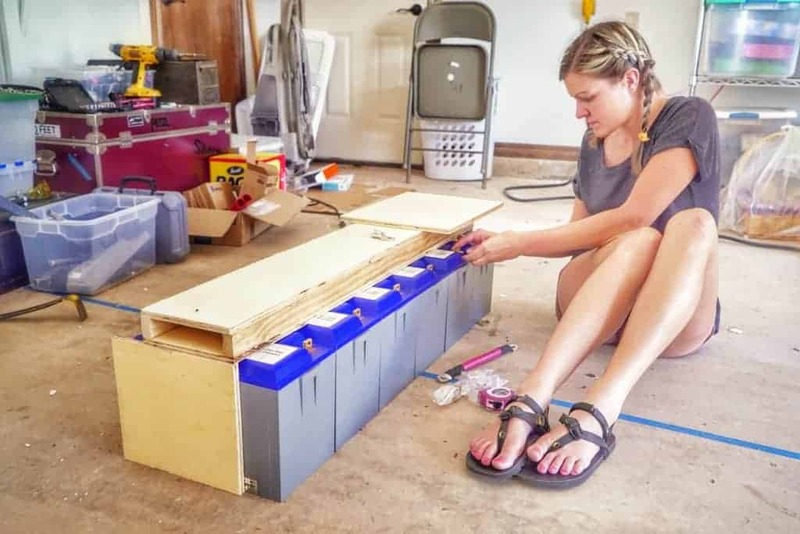 While there is no ‘one-size-fits-all’ answer to this, choosing a solar battery bank for your camper can be a daunting task. We’ve just switched over from AGM to Lithium (LiFePO4) Batteries for our battery bank. Here’s why we made our choice. The two most popular types of solar battery banks are AGM and Lithium. While flooded lead acid batteries are also an option, we aren’t going to talk about them today because of their many flaws (need to be vented, keeping up with chemistry, water levels, etc.). 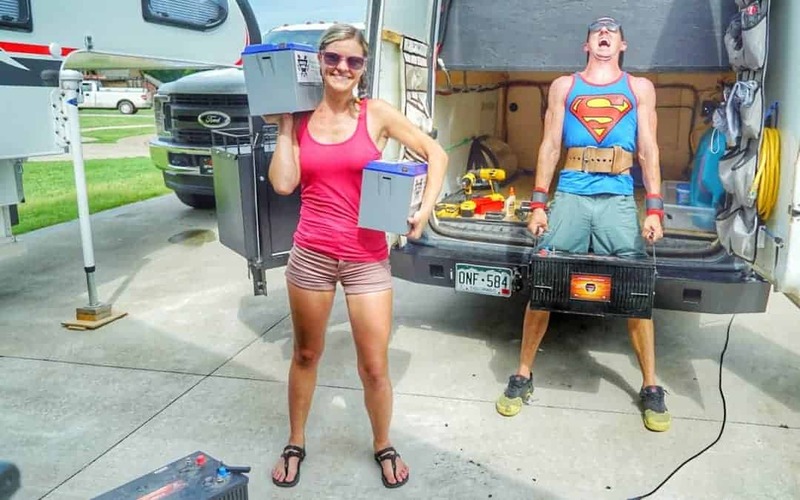 When we originally installed our solar setup in our campervan, we put in Trojan AGM batteries. While we did want Lithium back then, there just wasn’t an easy, readily available drop-in battery for lithium (that we knew of). Now, however, the lithium battery industry has made huge strides and has produced a wide array of options that are easy replacements for AGM batteries. Alas, we have chosen to upgrade our battery bank from 700 amp hours of AGM to 600 amp hours of Lithium. Now wait a minute, how are we upgrading if we are going from 700AH to 600AH? AGM batteries don’t like to be drained past 50% of their capacity, otherwise it will significantly decrease the lifespan of the battery. In essence, our 700AH of AGM was effectively 350AH. Lithium, on the other hand, can be discharged 100% and not affect the lifespan of the battery, making it a true 600AH of usable battery capacity. For the sake of easy math in this post, we’re going to compare 200AH of usable battery capacity. That is, 2 x 100AH Battle Born LiFePO4 batteries versus 4 x 100AH Trojan AGM batteries. And while there are many, many brands out there of each type of battery, we’ve chosen these two brands because they are a) top of the line in their respective categories and b) the ones we have had personal experience with. Battle Born LiFePO4 batteries are a direct drop-in replacement for AGM batteries, so they are very easy to install and get going. Let’s talk about some of the major pros of Lithium over AGM. The first and most heavily weighing (pun intended) on everyone’s mind when building a camper van is weight. A 100AH Battle Born lithium battery weighs in at 29 pounds, for a total of 58 pounds for a 200AH lithium batterybank. Compare that to AGM, which weighs a whopping 69 pounds each, making the total battery bank weigh in at 276 pounds. 58 pounds versus 276 pounds. That’s a huge difference! The biggest drawback of a lithium battery bank for your solar setup is the upfront cost. 200AH of Battle Born LiFePO4 batteries will set you back $1,900. The Trojan AGM batteries with a bank of 4 batteries for a usable bank of 200AH costs about $1,152. So choosing AGM over Lithium will save you $748. That’s a pretty big savings, right? Sure, the upfront cost of lithium batteries is a major investment. But let’s talk about long-term costs and replacement costs. Battle Born lithium batteries are designed to last 3,000 to 5,000 cycles. For this example, we are going to use the worst case scenario of 3,000 cycles. 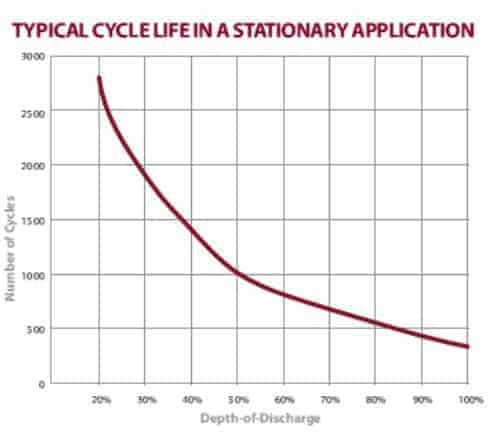 A ‘cycle’ is when a battery is drained, then recharged. Again, for the sake of the example, we will say a cycle is one day (use your batteries all night, then let them charge up during the day when the sun comes up). Denver gets an average of 300 days of sunshine per year, so in Denver, we would expect this battery bank to last 10 years at full capacity. After that initial 10 years (3,000 cycles), the battery is still expected to hold 75% of its capacity, meaning that you would still have 150AH usable battery bank. Trojan AGM batteries are designed to last 1,000 cycles. But, according to Trojan’s website, they consider their battery to be bad once it reaches 50% of it’s capacity. Comparing that to Battle Born’s 75% capacity isn’t exactly comparing apples to apples. Instead, we will take this graph (from Trojan) and adjust it based on how long the AGM batteries will last until they reach 75%, or 150AH usable battery capacity. Based on this graph, that would mean that the AGM batteries will reach 75% capacity at around 525 cycles. Using our Denver example, that will last 1 year and 9 months. And that does coincide with the generally accepted lifespan of AGM batteries lasting around 3 years to 50% capacity. LOVE this review! The only question I would have, is what would you recommend for folks living in a colder environment respectively year-round (Wisconsin, Michigan, etc.)? Do you think it would it make sense to go with AGM batteries per 3-4 months of the year being at or below 32F? 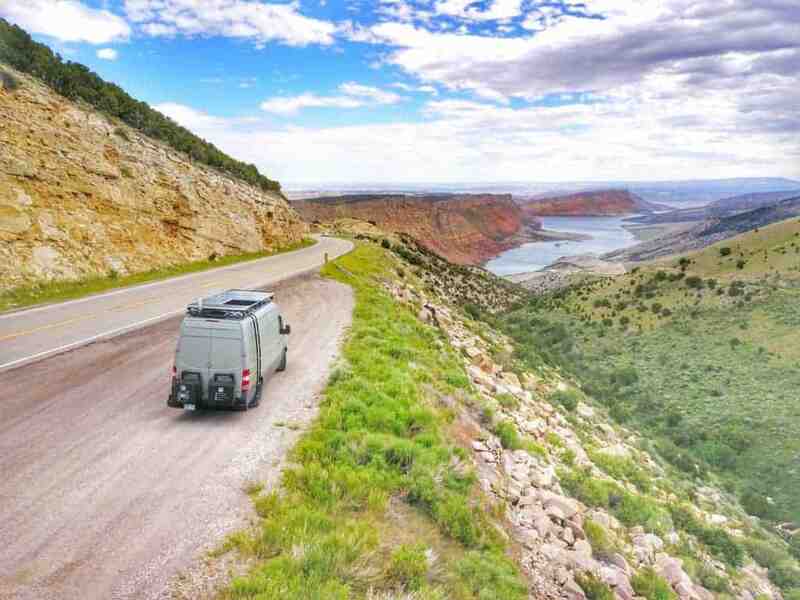 I recommend keeping your batteries, whatever type they are, inside the climate-controlled environment of the van/rv. Lithium batteries won’t charge if they are below freezing, but AGM batteries will have SEVERELY decreased capacity if they are that cold. Batteries like the stay warm.